A pleasant walk that takes us through the Albarda Garden, emblematic of the Mediterranean, autochthonous garden. Advance reservations for visits: Tel: 96 352 30 99 / 638 320 631. The roadbed is initially a dirt road, then asphalt along rural roads of minor traffic. - Agricultural landscape at the foot of the western face of the Montgó. - Guided visit through the Albarda Garden. La Xara halt of the railway line (FGV). LENGTH: 2.3 km. (one-way). Linear path. DURATION: On foot: 38 min. Bicycle: 15 min. ACCESSIBILITY: the garden is accessible along most of its path. It is advisable to travel by car to the entrance. SUGGESTION: if cycling, another option is to use the train or exit Dénia along the Volta al Montgó itinerary (Route 9) and turn off toward the Albarda garden at the corresponding crossroads. 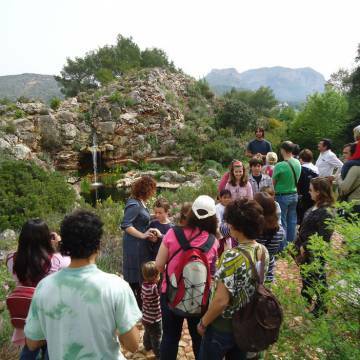 The visit to the garden Jardín de l’Albarda takes place accompanied by a guide who will explain the different types of garden and Mediterranean forest; a delicious delight for the senses. The garden has a recognized and award winning model for the creation of natural landscapes with splendid beauty and maximum sustainability: exclusive use of indigenous plants, adapted to our weather and soil, minimum water consumption, economical maintenance, absence of insecticides and pesticides, fertilizers, etc. The guided itinerary explores this classic Valencian garden with its Arabic influence, stony decoration, etc... Thanks to the variety of the flora, in all the seasons of the year we can find plants with blooming flowers, diverse colors and aromas which nature bestows on the visitors. There are plenty of singing birds, attracted by so much exuberance, where they can feed and breed, the sounds of flowing water, etc. FUNDEM foundation which is proprietor and manager of the garden is devoted to communicating the values of indigenous gardening and the purchase of mountain zones in the Valencian Community for the improvement and conservation of the Mediterranean forest.